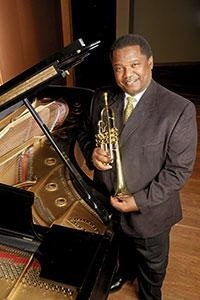 Larry Griffin began studying trumpet under Paul Taylor, principal trumpet of the National Symphony Orchestra in Norfolk, Virginia. Griffin also studied trumpet performance with Charles Schlueter, principal trumpet of the Boston Symphony; Manny Laureano, principal trumpet of the Minnesota Orchestra; David Baldwin, professor of trumpet at the University of Minnesota and jazz trumpet with Thad Jones. Griffin is a professor of music and the director of bands at Ohio Wesleyan University. In addition to conducting the Brass Choir, Trumpet Ensemble, and Jazz combos, Griffin has an outstanding trumpet studio and teaches Instrumental Conducting. Griffin has toured extensively as a soloist and clinician, including two solo China and three solo Switzerland tours. Griffin continues to teach and perform at the International Music Camp in Manitoba, Canada (1990–2019). In addition, Griffin is an active guest conductor throughout the United States, Canada, Australia, Europe, and China. Griffin is a freelance musician, clinician, and education specialist for the Conn/Selmer Instrument Company Inc., performing on Selmer, and Vintage One Trumpets. Griffin has performed with the Newark-Granville Symphony Orchestra, Central Ohio Symphony Orchestra, Columbus Symphony Orchestra, ProMusica Chamber Orchestra of Columbus, the Columbus Jazz Orchestra, Aretha Franklin and the Four Tops, (Carnegie Hall performances with Hezekiah Walker, BeBe Winans, Shirley Caesar, Azi Schwartz, Kenny Lattimore, and Ray Chew). Aside from performing, Griffin maintains a private studio. He enjoys helping young trumpet players develop their talents and explore creativity through music. Griffin strives to provide students with an exciting environment to learn the fundamentals of music performance. The chair, named for distinguished professor emerita, shall have as its honored recipient a professor who exemplifies the same teaching values that Libuse L. Reed portrayed during her tenure at Ohio Wesleyan. This recipient shall show academic discipline; he or she shall help students acquire the habits that build a foundation for intellectual outreach and the integration of all areas of knowledge to enrich their lives. This recipient shall also be accessible to provide empathy and encouragement to students, not only in the classroom but as an adviser and through extracurricular activities. Trumpet performance with Aretha Franklin on her final concert in New York City at the Cathedral Church of St. John the Devine on November 7, 2017. The trumpet studio at Ohio Wesleyan University strives to be one of the best of its kind in terms of its practicality, relevance to current professional standards and its effectiveness for preparing students to perform at the highest level. Weekly lessons are the centerpiece of each student’s experience in the Ohio Wesleyan University trumpet studio. Instruction is individualized to each player’s rate of progress. Students are encouraged to set achievable goals and find solutions to playing problems that develop skills of daily discipline. Students are also encouraged to use one another as resources for insight and support, and hopefully continue that into their professional careers to make them good colleagues as well as good musicians. The masterclass is a monthly opportunity for students to perform for one another. Each month involves an assignment to prepare material relevant to professional attainment along with an opportunity for discussion and constructive input from each student. In addition to gradually gaining confidence and poise under the pressure of performance, students learn important communication skills that help them to be supportive of one another, offering constructive suggestions for improvement. Performance Class topics include imitative duets with woodwind or string instruments; audition tape preparation; performances on piccolo and E flat trumpets; performances on the German rotary valved trumpets; sight reading; and technical Etudes. The trumpet ensemble offers opportunities for students to improve their section playing and communication skills. The Ohio Wesleyan University Trumpet Ensemble performs every semester in various locations around Central Ohio.